Beaulieu Road pony sales – oil painting by Alan Langford. Autumn, the time of year for the Beaulieu Road Station pony sales, when Commoners and other horse and pony owners gather to sell their livestock by auction. It’s a good place to buy a New Forest filly or colt, to meet friends or simply to enjoy an atmosphere that is as old as the New Forest itself. You may also see spirited cobs, favoured by Romani folk for their patience and strength, being put through their paces under the trees beside the auction ring. The working horse has always fascinated local artist, Alan Langford. 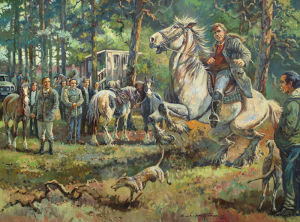 Featured here is his large oil painting of Beaulieu Road pony sales. 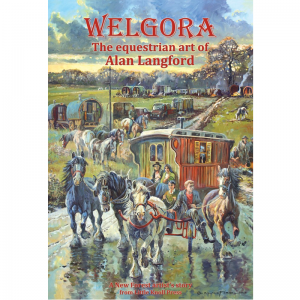 Alan’s book, WELGORA, provides Alan’s fascinating autobiography and full page spread pictures of his beautiful oil and watercolour paintings. An Early Lesson – sketch by Alan Langford. 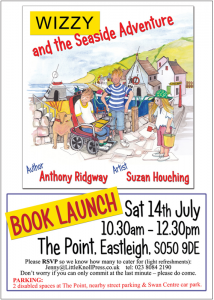 On 14th July 2018, a huge crowd gathered at The Point, Eastleigh, for the launch of Wizzy and the Seaside Adventure by author, Anthony Ridgway, and artist, Suzan Houching. Among those attending were Sheila and David Suchet, Ros Holness and Tina Fanshawe. Anthony gave a speech full of humour, praising his mother, Grethe, as his ‘harshest critic’, and thanking Barbara Large for helping him hone his writing skills. 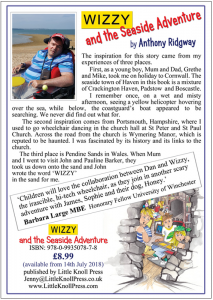 David and Sheila Suchet read a section from Wizzy and the Seaside Adventure, and Wizzy the wheelchair, of course got a look in, making a phone call half way through the reading! 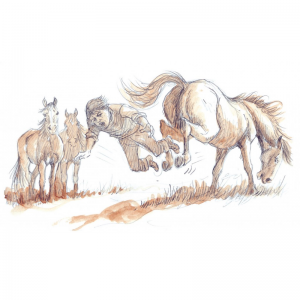 Tina Fanshawe’s horse, Nellie, was the inspiration for the plot in Anthony’s first book, Wizzy the Animal Whisperer. 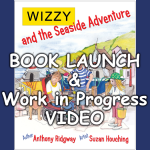 In Wizzy and the Seaside Adventure, Honey, the dog, shows the same empathy, helping the children bring to justice some rascally thieves. The beautifully illustrated large format Wizzy books can be read again and again and enjoyed at many levels – for the adventure story, for the fabulous pictures, to read out loud or to read in your head … although it’s hard not to laugh out loud at the funny moments created by Wizzy the hi-tech wheelchair, who takes everything literally and cannot understand the idiom of human speech. Click here to find out how Anthony writes. A NEW WIZZY STORY IS ON ITS WAY! Saturday 14th July 2018, 10.30am – 12.30pm, The Point, Eastleigh.